1. 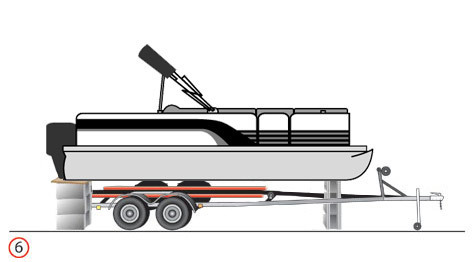 Place the boat and trailer on a firm, level surface [Diag.1]. 2. 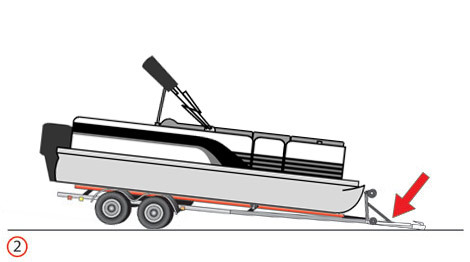 Lower the tongue of the trailer to the ground to elevate the transom. [Diag.2]. You may need a friend to help keep the tongue down. 3. Block the transom using cinder or wooden blocks [Diag.3]. Make sure that there is a 2”x8”x16" wooden plank between the pontoons and the blocks to prevent damage to the boat. If the blocks and wood do not fit between the ground and the boat, you may have to use additional pieces of 2”x8”x16" wooden plank to compensate for the difference. 4. 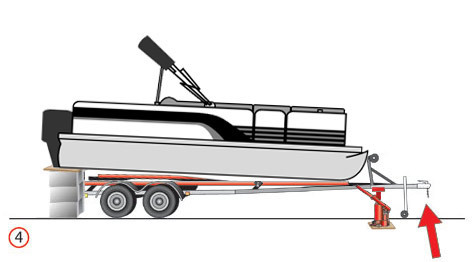 Place a hydraulic bottle jack under the tongue of the trailer and raise the front of the trailer [Diag.4]. 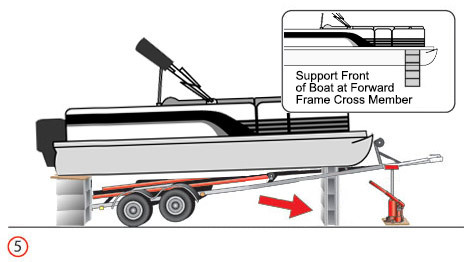 When the jack extends as high as possible, you may have to place blocks and wooden plates under the front cross member to support the boat. Then lower the jack and use wooden plates under the jack to give you additional height. Continue jacking up the trailer. This procedure may have to be repeated several times to gain the necessary height. 5. 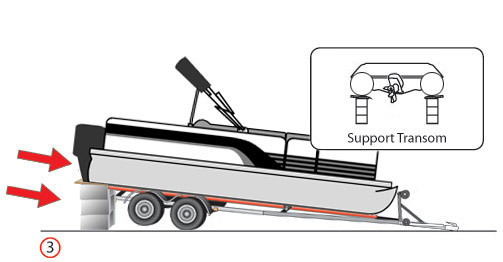 Continue raising the front of the trailer until the boat is level or slightly bow high. Place blocks with a 2”x8”x16" wooden plank on top, under the front cross member to support the boat. [Diag.5]. Start lowering the jack until the weight of the boat is supported on the three columns of blocks and plates. Make sure that the boat is well supported on each column and is stable. 6. Lower the bottle jack. Extend the trailer jack to support the tongue and remove the bottle jack [Diag.6]. 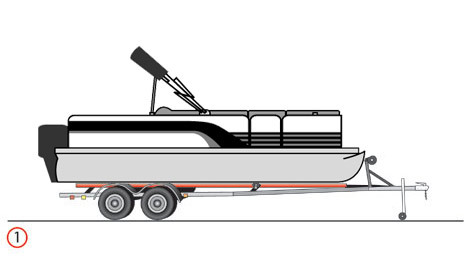 The boat should be well supported and stable on all three columns and the bunks of the trailer should be about 6 to 8 inches lower than the bottom of the boat. This will give you clearance to clean and polish the areas normally supported by the bunks.